Note: This pattern uses Australian crochet terminology throughout. Eg Double crochet = US single crochet etc. 2 round pieces of felt, one the size of a 5 cent coin and one the size of a 10cent coin. Right side: 4ch, 11tr into the 4th chain from hook (there should be 12tr incl the 3ch missed at the beginning). join with a sl st in 3rd of 3ch. 3rd row: 1ch, holding last loop of each dc on the hook make 1dc in each of the next 3dc (there should be 4 loops on the hook) yoh and draw through all 4 loops, *sl st down the side of the ear and across the next 4tr (this brings you into position to make the next ear) rep from * to * to make the second ear, fasten off. 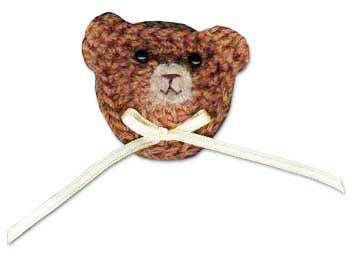 Face: Embroider the smaller piece of felt using satin stitch for the nose, two straight stitches down to the mouth and two fly stitches for the mouth. Sew the face to the right side of the crochet piece in the centre. Place stuffing at the back of the crochet piece, covering the first round. Push forward to shape the nose, place the larger piece of felt over the stuffing and sew into place. Sew the eyes into place, make a bow and stitch to the second round. Glue a brooch clip or magnet onto the back.